If you have a little gourmet ice cream or frozen yogurt shop it is of utmost importance to make sure that you are going to be highly visible to people passing by. Why? Ice cream and frozen yogurt tend to be an impulse buy for many people. The point is that the treat itself can sell itself as most people love frozen treats without much question. Your goal as a shop owner or manager is to make sure that the idea of acquiring the treat is planted in your potential customer’s mind the minute they see what your shop has to offer. If you have a little boutique shop of any kind you really need to have at least one sandwich board pointing to your business. The most important one should be directly on the sidewalk in front of your store. Do not stick it in the middle of the sidewalk as that makes it more of an annoyance than a method of persuading people to come in. This chalkboard should have a striking border that catches the eye somehow. A neon color is good. Neon pinks and lime colors suit an ice cream store. You should also have a graphic or image of what you are selling on there. For instance, if you are selling a cupcake put an illustration of the most delicious looking cup cake you can find on there. Using colorful chalk is also recommended as it catches the eye more than regular chalk. You can actually buy chalk in a neon color. Do not be one of those stores that let a bored and lazy employee write in illegible writing on your sandwich board. Make sure it is readable. 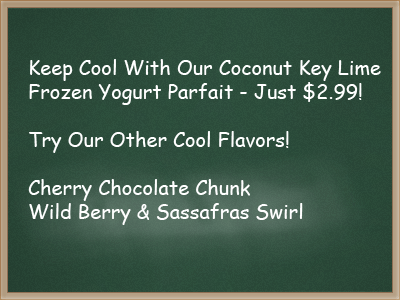 Make sure you have the prices on these treats on the board as well. Consumers like the security of knowing what the price is before they go into a store to buy it. It is also classic to put a pithy quote on a sidewalk sandwich board. You can find these online on any topic. It is also a good idea to have a second sandwich board at the nearest intersection pointing your customers towards your business. Often you can ask an existing business if you can chain the board to their property or you can usually chain it to a light post. If you live in a small and friendly town you may not have a problem putting a sandwich board wherever you want. If you are operating in a big city, you will have to get creative. What’s In Your Store Window? Since you are selling food the best thing you can put in your store window is an example of your product. Put the effort into arranging a good, creative window display that sparks your customer’s appetite. For the traditional ice cream shop, people have grown to expect to see a clean, white (and often pink) interior. It must be pristine. The décor should be very, very simple and elegant. Furthermore customers traditionally expect to see employees in uniforms, with covered heads and friendly smiles. Nothing should be too casual and nothing should look cluttered or dirty. A window display does not have to be complicated. It has to only capture the gist of what you are selling. For instance if you are having an event called Cherry Bomb Days where you are selling cherry yogurt and cherry smoothies you can put a giant cherry in the window, your logo done in an arrangement of cherries or an example of your product. One thing that really works in a window is a list of all of your flavors. Most people have a grazing instinct that will compel them to stop outside your window and peruse the menu. This works best if you are showing the product in use. For instance, if you are selling a decadent chocolate sundae do not just show an image of it on the coupon. Show someone that your customers can identify with enjoying and eating it. If you use illustrations, make sure that they make sense. They should be there to enhance your credibility, aid the understanding of your product and create desire to buy it. If there are any health benefits to eating your yogurt you should also paste that inside the window near the door. Any good reviews, articles or information about the yogurt or ice cream you are selling or even about any of the toppings you are selling will go a long way towards attracting people to your shop. Another sign that you can post on the window that will always get their attention is the words “Free Yogurt Samples!” or “Sample any flavor before you buy!” This is sure to invite those passing by into your shop. Another important component of your store window should be your logo and the name of your store presented, preferably, dead center in the window. Make sure your branding is everywhere, including on the front door, all signage and the door stoop. As we now live in the days of the Internet it also really looks professional if you have the URL of your website on your door stoop or on your window somewhere. Some individuals like to have this type of detail on their window shades or arbors. 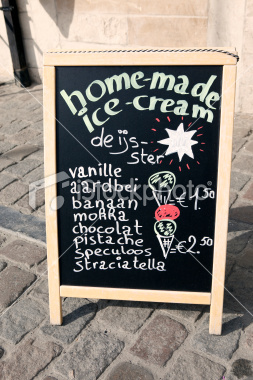 There are also two styles of décor that seem to really suit an ice cream store window front: retro and neon. Ice cream is a comfort food and is often associated with the old fashioned ice cream parlor which rings of retro fonts, pink and white décor, mirrors and lots of pictures of ice cream. Neon signs are also iconic of ice cream parlors. Having an OPEN neon sign is nice but so is a neon sign done in the shape of a cone or even in the shape of your logo. Study popular brands to see how they arrange and display their products and how they decorate their shops. Identify the principles (not necessarily the specific practices) in their displays and décor and adapt them to your own shop. When you own an ice cream shop, frozen yogurt shop or any kind of business venture that really does depend on outside foot traffic stopping, taking a look and then deciding to enter your store it really does make sense to have design features outside of your store that will make them do exactly that. One great feature to have is a front bench. Make sure that it is long enough to seat several individuals. The idea is that people will order a frozen yogurt or ice cream cone and then sit in front of your store relishing the treat. There is no better advertisement for your ice cream then the sight of people sitting in front of your store enjoying your product. If a long bench does not fit then try outfitting the front of your shop with some wrought iron chairs and tables. If people have a comfortable place to sit and enjoy their take-out product they are much more inclined to buy. Another idea is to remember the dogs. A great attraction for many dog owners is the business that not only has the pole outside that is convenient for tying up a dog but also a bowl of water and a bowl of treats. You will attract a lot of people and also be looked on very positively if you make room for a pet while doing business. Another nice touch is a place in front of your store where it makes it easy for your customers to lock up their bikes. Don’t allow smoking on your patio and make sure it is always completely clean. Keep any umbrellas clean and make sure that the benches or tables do not become sticky. One great way to attract people into your store is to have a store employee standing outside with a little dish of free yogurt, cupcake or other samples. On a really hot day you can offer free water or lemonade in exchange for an email address that you can use to market your products to them later. You should also never ever miss having some kind of celebration outside your store on special holidays. For instance if it is your store’s one year anniversary in business be sure to decorate your front with balloons and give your customers some kind of reward or present for buying from you on that day. When it comes time to celebrate any of the holidays be sure to decorate your store front accordingly and come up with treats that are in line with the holiday’s theme. For instance for Halloween you could serve yogurt mixed with candy apple chunks or pumpkin pie ice cream. On Valentine’s Day be sure to decorate the place with hearts and cupids and serve up a similarly themed dessert such as a Angel’s Chocolate Sundae or Chocolate Covered Strawberry frozen yogurt. Another great thing to do right on the front sidewalk in front of your store is to raise money for a local charity. You can offer the product free product in return for a donation to a community charity. The word community is key here because you are attracting local foot traffic. Finally if you are going to use a good cause to raise your profile then make sure you make it clear that most if not all of the proceeds are going to the charity (aside from basic operating costs.) This will substantially raise goodwill toward you and your business in the community and give you a great reputation. If you do not explain how much of the proceeds are actually going to charity then people may see you as actually using the misfortunes of others to make money and that is exactly what you don’t want! 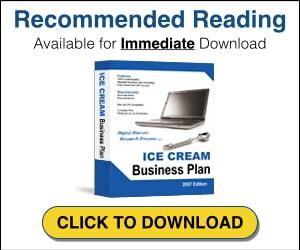 Have your own ideas for optimizing your ice cream shop’s visibility? Share your story with us!